A versatile tool in handyman’s toolbox, a durable adjustable wrench is a convenient tool to own. They come in a variety of sizes, and each one can accommodate many sizes of nuts and bolts, so you aren’t forced to bring along an entire box wrench set, and wind up fumbling through it looking for the right size. These tools feature one fixed and movable jaw. The fixed jaw is part of the one-piece overall wrench and takes the brunt of the force. Here are the best wrenches we found that you’ll be glad to have when you need them. Stanley has always had a reputation for quality tools and the 90-949 is no exception. A lot of people have a growing stash of wrenches of all kinds, but a good adjustable is something they rely on the most. It feels comforting to pick up a tool that feels solid and well-made in your hands when tackling a tough, dirty job. The jaws open to an extra-wide 1 3/8 capacity which is great for a mid-size wrench. SAE and metric scales are there with laser-engraved markings to avoid guesswork. Overall construction is a strong forged-steel alloy. This tool is well made with almost no play in the grip of the jaws, and comes with a limited lifetime warranty. Most toolkits will come with a lot screw driver tips, allen wrenches, and other accessories that you’ll never use. A basic tool kit for quick repairs will consist of pliers, an all-in-one screwdriver, and a good adjustable wrench. That’s the Stanley 90-949 10″ adjustable. Weighing in at one pound, its heavy enough so you aren’t afraid of putting some real torque on it, but light enough so you won’t mind carrying it around in a pocket. The soft handle makes for a comfortable grip without being bulky, and the jaw opens smoothly and sits snugly. The markings for the width seem to be quite accurate, and the worm screw that guides the movable jaw seems to do its job nicely, without the grating or skipping of cheaper models that don’t seem to want to stay where you’ve adjusted them to. Stanley makes sturdy, reliable hand tools, and if you don’t have one of their wrenches, the 90-949 is a great place to start. The thickness of the tool is only .7 inches so you may find it fits better into tight spaces than some angled wrenches will. If you like a handsome wrench and not just a flat ugly piece of metal, you’ll also be pleased with the Stanley. It looks and feels great and you’ll be proud to have a nice tool like this on your workbench – it gives you the sense of being professional about your work, even if its fixing your kid’s bicycle. This wrench has good tolerances and opens as wide as any 10″ adjustable out there. If you like the 90-949 – and there’s no reason you shouldn’t – you may find yourself hunting around for the 6″ or other sizes to make up a good set. The wrench is rustproof, but it’s true that the metal surface does not have a high polish. Like any wrench, this is a workhorse which will soon be covered in grease and sweat. Giving your tools a good shine afterward is probably not high on your list of things to do. It is compact for a solidly built wrench, so you should have no problem tucking it away in your vehicle somewhere so that it’s there to help in case of emergencies repairs. You can find this wrench for under $10, so that’s a steal for the quality you’re getting. As affordable as it is, you might even want to get a couple of them. The Stanley 90-949 is a winner, just as good for the professional toolbox as it is for the home DIY crowd. It combines solid construction with good design. After a while you’ll find yourself using it so much that it gets a prominent place on your workbench and it’s the first thing you reach for. Like any adjustable, you won’t get precise fit – that’s why they make those bulky wrench sets. But if there’s one tool that you should keep handy for all your work, it’s the Stanley 90-949. Channellock boasts that the 8WCB WideAzz, at only 8″ long, has the same capacity as a 12″ wrench – and it just might. The jaws open to a width of 1 1/2″, which is surprising in short adjustable that weighs only 4 ounces. The longer channellock jaws also provide better grip. So you could say this is basically a 12″ adjustable with a shorter handle. The tips of the jaws are on the pointy side, so if you’re carrying it around in a pocket you’ll want to be careful how you sit down. That makes it kind of an odd-looking wrench, like a worker ant, which is not a bad feel to get from a wrench. Only this one is actually quite handsome with the stylish Code Blue grips and chrome vanadium finish. It has the standard markings on one side and metric markings on the other to make sizing easier. It’s comfortable to hold but feels very light for a wrench of this size. It is very durable, though. Some users have reported beating on the wrench with a hammer to break loose stubborn nuts, with no slippage from the 8WCB. It may look a little unusual, but it’s a serious wrench. The 4-thread screw gear moves smoothly and consistently. This may be the best channel lock adjustable around, short and light enough to slip easily into your tool belt or pocket, while so durable in construction that you can put a lot of muscle into tough jobs. The softer grips work so well that it can be use all day without any discomfort. If you aren’t too worried about sore hands, you can always take the removable grips off easily enough, and of course the wrench works just fine without them. Some people like the feel of solid metal in their hand, and damn the callouses. The wide 1 1/2″ (or 39.5 mm) capacity means you can turn anything from quarter-inch nuts to standard pipe joints with the same tool. In some cases it can actually get around 1 5/8″ nuts. In fact, that is wider than some 12″ wrenches, including monkey wrenches. It is a bit thick at 1″, but the wide grip and short length make this great for working on plumbing in cramped spaces such as under a sink. It will become a favorite wrench for your home plumbing work, with no notable flaws, except perhaps the price. It costs $25 and up, more than twice what the Stanley does, but if you really need a reliable channellock wrench for cramped spaces, you won’t find one better than the 8WCB. In fact, the 8WCB is getting harder to find, so you might want to jump on it if you get the chance to buy one. For those who are on the go with their toolkits, such as maintenance workers, this is one of the wrenches you’ll want to have in it. It can do an awful lot for you for such a light-weight tool. The 8WCB comes from a Spanish company called Irega, which you might never have heard of. But they apparently make only adjustable wrenches, and this wrench is pretty solid proof that they are good at what they do. The 8WCB is a good tool and highly recommended. 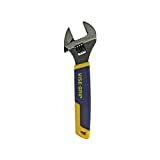 At 1.8 pounds and dimensions of 14.8 x 4.4 x 1 inches, the IRWIN 2078612 is a fairly big wrench, so you may be a little disappointed in the 1 1/2″ (38.1 mm) maximum jaw width, at least compared to some of the other tools on the list that manage as much from a smaller tool. However, there’s no doubt the IRWIN VISE-GRIP is a durable and well-made tool. It’s made from the rust-free chrome vanadium alloy, with stylish blue and yellow grips to provide extra comfort. It has the usual English and metric scales engraved to make sizing easier, and the space at the end for hanging it prominently on the wall of your workshop where you can get to it quickly. It can be either expensive or cheap, depending on how much home work you do. List price is advertised at $28, but with a little comparison shopping, you can find it as cheap as $10. If you need a good heavy wrench that performs the way you want it to, it’s probably worth it at either price. This is another tough IRWIN tool you can put some real torque on. IRWIN uses an induction heating process to make the edges of the jaws extra-hard. This is the sort of heavy wrench you can slip a piece of pipe onto for extra leverage in breaking loose those seized-up bolts without worrying about damage to the tool. The screw key works smoothly and easily to adjust the width, and the moveable jaw stays in place. No-slip thumb action with perfectly parallel jaws means a tighter fit. You shouldn’t find much to complain about with this; it’s a heavy wrench made for the bigger jobs, and works as advertised. IRWIN offers a lifetime guarantee, so you know you’re getting something that isn’t going to fail you. The design of this wrench is top-notch. It looks and feels like a quality, professional tool. The jaws move into place with the slightest effort and give no signs of wobble. The plastic grips on the handle seem a little over-soft, but you’ll be glad there are there after working loose a few tough nuts, especially in cold weather when handling a metal tool gets uncomfortable. The slip-resistant ProTouch grip covers the whole shaft, making the wrench seem a little bulkier than it is, but at times it’s nice to have. Handling a bigger wrench can get hard on the hands after awhile. IRWIN wrenches are known for fine mill work, which in this category means the jaws hold their position with no slop or skip as long as you need them to. Another part of the IRWIN 2078612 appeal as that this wrench uses the same basic adjustable design that’s been around for years, so you instantly accept it as a familiar working tool, with no questions about ergonomics, odd angles, or funny-looking parts. It’s simply a heavy-duty wrench that does its job well. It may be a little big for working in some spaces, but when you have a job with heavy bolts that’s going to involve some real torque, the first thing you’ll look for is the 2078612 adjustable. This gets the bargain spot because the Stanley 87-369 is a no-frills adjustable wrench, with no plastic grips or fancy colors, just a solid chrome vanadium wrench that looks like it belongs in a tool box. It does have the Stanley name to live up to, it coms with a limited lifetime warranty. It’s inexpensive, with the MSRP set around $13, which means you can get it a lot cheaper than that. The size is 10 x 2.9, with a narrow thickness of only 0.6 inches, which is good for getting at nuts in narrow spaces. It weighs in at 9 ounces, so it’s a solid tool which you can carry easily in your pocket. The surface is rust-proof and no fancy plastic grips to worry about, so you won’t care about dropping it on the driveway. It opens to just a little over an inch, 1.071 to be exact, which is not great but suitable enough for household jobs. There seems to be some question as to whether its made in the USA or in China. My guess is it’s made in one and packaged in the other, but that’s just a guess. Either way it bears the Stanley name and lives up to Stanley expectations of quality. The 87-369 shows good machining, and the moveable jaw stays where it’s set, not too loose and not so tight it won’t come off again. It feels solid in the hand, but almost too small, yet the 1″ jaw width is good enough to handle most bolt heads, and the 10″ length gives you a little more leverage than shorter wrenches. It’s a good, serviceable wrench that never loses its grip, and sizes easily up to the standard and metric markings on the head. A good accurate scale like this is also useful for quick sizing so you grab exactly the right sized socket or box wrench to get in the tight places. It may look a little plain, without the machismo of the big IRWIN or quite the feel of quality you get with the Stanley 90-949, but it’s plain little brother, in the shape of the 10″ 87-369, is an affordable and steady tool to keep around when space won’t allow one of the bigger wrenches. It’s pretty much a foregone conclusion that no adjustable wrench is going to fit over a nut or bolt as snugly as a box wrench or socket that’s been made to fit the exact size. With looser-fitting adjustables that don’t hold position, that’s liable to mean slippage that could only lead to frustration and skinned knuckles. An adjustable with a moveable jaw that won’t hold position is useless on nuts unless they’re already loose. Good wrenches are engineered so that the more torque you apply, the less likely they are to slip. Before you buy an adjustable, find a nut or bolt to try it on, then take it off and check how it fits to the bolt again. If there’s suddenly too much play there, find a different wrench. If you’re like most people, you probably don’t care to replace your tools more often than you have to. Forged-aluminum wrenches can actually break off, and cheaper stainless wrenches bend like noodles. Pick the right size wrench for the force you’ll need to apply. And be careful about using extras to apply more leverage, like pieces of pipe. They can ruin an adjustable that isn’t built to withstand it. But by all means, you want a wrench that can take your best effort and considerable abuse without suffering performance-wise. Solid metal is ok for small jobs, but if you’ve got a lot tight bolts to loosen – and tighten up again when you’re done with the repairs – your hands are going to get tired and sore, or get even colder in winter weather, and that could lead to slippage. No need to punish yourself. Look for models that have a nice plastic grip that will be easier on your hands and give you better control. Wearing a glove or wrapping the handle in a rag will actually cut down visibility and control. Use a bare metal wrench only for smaller jobs that won’t require a lot of force. Adjustable means adjustable, but that doesn’t mean one wrench will do it all. You don’t want a big wrench for doing small jobs, even if it will fit, or a small adjustable for doing heavy jobs like automotive work. Most people have at least three adjustable wrenches in their tool box – small, medium, and larger. Professionals like plumbers will have a wider assortment and some really big sizes. Sometimes a bigger option just won’t fit. If your tool is so big you can’t see the nut, don’t use it. Adjustable wrenches are a terrific tool that can save a lot of fuss and handle a wide variety of jobs, but they don’t work miracles. Sometimes it’s just not the right tool for the job. They are more prone to slippage than box or socket wrenches, and they can damage surfaces like the chrome finish of kitchen and bathroom fixtures. While pipe wrenches and monkey wrenches are different kinds of adjustable wrenches, its important to know the difference and to use the right tool for the right job. An adjustable wrench is not a pair of pliers and it’s not a hammer. But with a little common sense, a quality adjustable is important to have because it will serve you well in a variety of situations.